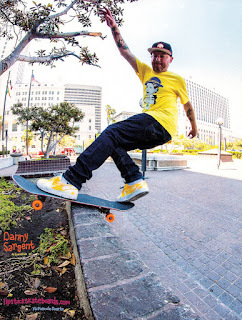 Vert Is Dead: Danny Sargent #5. Proper style for frontside sliders. It's always cool when old pros from our youth pop up in random ads doing a sick trick. I'm guessing Lipstick Skateboards is based in either Oregon or California somewhere. I couldn't find an address, but from their Instagram, it looks like the riders travel a lot or live in different places. The company was started in 2016. The team includes Travis Willis, Neil Heddings, Aaron Roney, Bob Anderson, Kenny Ufford, Doug Korfhagen, Peter McClelland, and Tommy Cuba. Marcelo Duarte was the photographer.